Robert Ward Clary was married a second time, but his wife and stepchildren from that marriage will not be added to the database due to our focus on Garrison descendants. Please see Sources for more information about his second family. [S56] Funeral Home Obituaries & Funeral Notices, 17 Jan 2013. 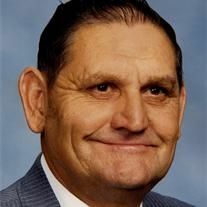 Robert Ward Clary, 79, of Fairfield passed away May 30, 2012. He was born March 7, 1933 in Dew to Ben Clary and Annie Heard. He is survived by his wife Emma Clary of Fairfield; children, Kathy and Paul Frost of Rossville, GA, Michael and Cindy Scoggins of Kingsland and Sondra Bernard of Fairfield; nephew, Robert Gehrels of Sunset; six grandchildren and four great grandchildren. He is preceded in death by his parents; son, Terry Clary; two sisters, Louise Husketh and Dean Ellison. Visitation will be Thursday, May 31, 2012 from 6-8pm at Griffin-Roughton Funeral Home, Fairfield. Services will be 11:00am Friday, June 1, 2012 at Griffin-Roughton Funeral Home, Chapel in Fairfleld. Burial will follow at Dew Cemetery. Pallbearers are L.J. McAdams, Kevin Clary, Jason Scoggins, Jeffrey Scoggins, Brandon Pagleno and Roy Myers. Honorary pallbearer will be Dustin Frost. [S11] Find A Grave, (www.findagrave.com), 16 Jan 2013.